Personal Protective Equipment is not a choice. It is a requirement for your job. If you are the lawn maintenance guy you wear hearing and eye protectors when you are using a blower or weed eater. If you are a chemist, you use eye shields and protective clothing when pouring chemicals. If you are the steel worker who works with molten material, you have clothing and equipment that will protect you from the heat, fumes and hopefully minor splash. Most Public Safety Divers are involved with some part of Emergency Services; Fire, Law Enforcement, Advanced or Basic Life Support. In ALL regards, those who are volunteers working with a volunteer team MUST be working for or under the auspices of a local Law Enforcement or Fire service. When working for emergency services, we use Personal Protective Equipment or PPE on every call we make. Those of us who respond to medical calls or have the potential to do so usually keep a box of latex gloves handy. In anticipation of patient care, most of the time, we put gloves on before we even see the patient! As firefighters when we need to enter a structure that is on fire, we automatically don our bunker gear and SCBA. A police officer puts on a bullet proof vest with the same casualness he puts on a t-shirt. Each of them use PPE everyday with no thought or effort and it is not only expected, it is required. When we move to special teams within our departments we generally think of the Haz-Mat and SWAT teams first. First Responders are trained to identify specific types of threats from hostage situations to potentially hazardous chemical spills. We are trained to keep away and secure a safe zone for civilians while waiting on a specially trained team to respond and mitigate the threat or hazard. When they arrive and there is a need, they don their PPE before they approach the danger zone. That PPE is need specific and can include anything from bullet resistant shields to full encapsulation suits and self-contained breathing apparatus. No one questions their need to do this and in fact call them because they have the training, equipment and ability to do the job. The concept of water column is quite important, since many aquatic phenomena are explained by the incomplete vertical mixing of chemical, physical or biological parameters. For example, when studying the metabolism of benthic organisms, it is the specific bottom layer concentration of available chemicals in the water column that is meaningful, rather than the average value of those chemicals throughout the water column. As a specialty response team, Public Safety Divers often face an unfair and biased prejudice. Because we start as recreational divers and train in swimming pools and clear (sometimes) lakes or ponds, we seem to be looked upon as a nuisance until we are needed. With a few exceptions, Public Safety Dive Teams are underfunded, understaffed and definitely unappreciated for what they do. That being the case, it is sometimes difficult to obtain necessary funding for items the team needs in order to be safer at their job. One of the main items we need but rarely seem to obtain is exposure protective suits. In the southern states of the USA, we tend to be more oriented to lightweight wetsuits or dive skins and in the northern states, teams are more likely to have dry suits available to them for cold weather diving. Dry suits tend to be looked upon as a protective tool against cold. They were originally intended to offer thermal protection and are used by the recreational and PSD diving communities for that reason. Recreational divers using dry suits typically dive in cold water environments up to and including ice conditions. As a practice and objective of diving, they almost always stay within the borders of the water column. Public Safety Divers as a rule, do not. Public Safety Divers are in the water to locate something that was either lost or disposed of underwater. If that something was floating, we would not need divers. Public Safety Divers tend to dive ON the bottom and not within the water column. On the bottom is sediment. Sediment is naturally occurring and consists of a variety of most everything that water touches or is touched by water. It is a vast mixture of organic material that is broken down by processes of weathering and erosion, and is subsequently transported by the action of water. Sediment contains chemicals, minerals and metals that are not naturally occurring and are a result of runoff, spillage or pollution. These are not usually water soluble and have a specific gravity greater than water. In general, they sink and come to rest in sediment. “Quite a few years ago we got a call that a car had been seen just underwater near a boat launch site at the bayou. It was August in South East Texas and no one knew how long the car had been there. I drove my ambulance down to the site just to see what was going on and as soon as we got out of the cab we could smell a slight odor of decomp. I figured there was someone still in the car. The local police did not have divers and the VFD did not have any divers either. I had dive gear at home and volunteered to go get it and see if I could tell if there was a body in the car or not. It took me about an hour to get it all together and get back to the scene and by then there were a lot more people around. I wasn’t excited about having all those people watch me try to remember how to put my stuff together but I was there and everyone was expecting me to dive. I managed to not embarrass myself and made it into the water. I swam upstream to where the car was and the smell of decomp got stronger the closer I got. When I went under I felt around and discovered that it was a van and that the driver’s door was open. The whole time, I swear I could smell the decomp. I felt around inside the van and found the driver. I know it sounds disgusting but I tasted her before I actually touched her. I was gagging trying not to throw up the whole time I was under. I manage to get her out and to the surface. I swam her to shore as fast as I could. By now there were news crews there filming and it was all I could do to keep from throwing up. The water was warm enough that her body fat had started to melt and it was like I was covered in it. My ambulance was blocked in and I couldn’t leave. I had nothing to wash off with and just a towel to dry off. After a few minutes I couldn’t help it and puked everything I had eaten for the last month. I finally was able to leave and get home to shower off. Dioxins are much heavier than water and not water-soluble. (Agent Orange is not water soluble). Minerals and metals are heavier than water and are not water soluble. Mercury sinks. Chlorobenzenes are not water soluble and the amount of chlorobenzene in sediment may be 1000 times higher than that of the surrounding water. Which would you want to rub into unprotected? It does not matter what chemical, mineral or metal we name as a contaminate. If it is in the sediment, it is where Public Safety Divers dive. Those contaminates can be carcinogenic, cause skin burns, blood poisoning, or any number of other medical disorders. Divers can be exposed by direct contact, oral and / or dermal absorption and even inhalation if not properly decontaminated. If your team works in areas that are prone to floods or hurricane flooding, your potential to exposure can be even greater. In normal conditions, heavier than water particles sink to the bottom and become part of the sediment layer. In flood conditions, those same sediment layers will be disturbed and even mixed back into the water column. In those instances, divers are at risk in the water column as well as in the sediment layer on the bottom. Likewise, water rescue teams working on the surface or in wading depth waters are also exposed. 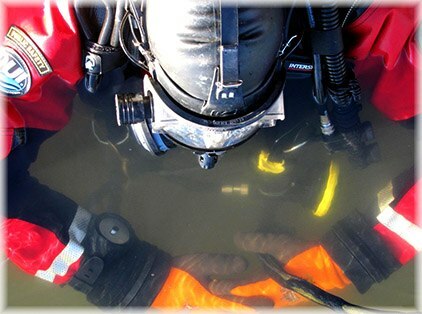 To evaluate the potential exposure and health risks for a diver, information is needed on the level of contaminants in the media (i.e., sediment and water) that that diver is being exposed to as well as information on the diver's behavior (e.g., type of equipment worn, frequency and duration of diving, years spent diving, and amount of inadvertent sediment and water ingestion) and the diver's characteristics (e.g., body weight, surface area of the body). We are not chemists. We do not analyze water or sediment samples. Even if we were, analyzing for all the chemicals that might harm us in sediment it would take weeks and costs thousands of dollars. We should have common sense that would keep us away from exposures that would harm us. If we looked at a list of non-water soluble chemicals that were definitively harmful or lethal and if any of those chemicals were spilled on dry land, is there any Emergency First Response department that would allow any of their employees to mitigate the hazard or work in the environment without proper ppe? Contaminants include metals, pesticides, polycyclic aromatic hydrocarbons (PAHs), volatile and semi-volatile organics (VOCs/SVOCs), polychlorinated biphenyls (PCBs), and polychlorinated dibenzodioxins, and dibenzofurans. In addition, frequent sewer overflows contribute high bacteria counts during rain events (USEPA 1998). But Public Safety Divers do it almost every time we dive. The divers work in a surrounding atmosphere that is lethal without an air supply. IF they are dealing with zero visibility as well, they are doing it completely blind. Is there any haz-mat team or EMS system that would allow their employees to work in a hazardous environment with no ability to see and little or no PPE? Is there a police officer still alive who would enter a gunfight wearing nothing more than a SWAT t-shirt and a blindfold? Just how ludicrous do we need to make these comparisons or illustrations to understand what PPE means to a Dive Team? 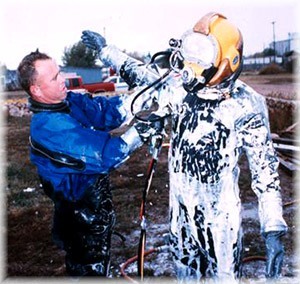 If your dive team is using dry suits for thermal protection only or your team does not see the need for dry suits, then you are lacking the proper awareness of PPE for the job. If you insist on wearing gloves on medical calls, you must use the same reasoning and common sense when considering the protection a dry suit affords. There may be budgetary issues that cause your administration to restrict purchasing some items. When your equipment request for dry suits was denied or altered for them, you probably asked for dry suits and not “PPE”. Unless or until we recognize the potential hazards and likely exposures to ourselves and our team members and educate our administrations to those hazards, nothing will change. We are essentially allowing them to accept the ridiculous idea that firefighters do not need bunker gear, police officers do not need Kevlar vests and Paramedics do not need latex gloves. Drysuits = Personal Protective Equipment. It is time we accept that and work towards proactively protecting ourselves and our teams. 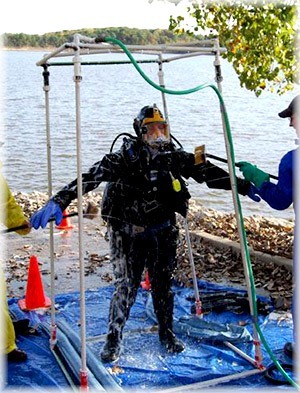 When you submit your budgets or make equipment requests, do not ask for dry suits. Instead, ask for appropriate Personal Protective Equipment (PPE) for your divers. Depending on your submission requirements, you may need to justify the request and if so, there is a wealth of information and help to be found on the internet, from dry suit manufacturers, the U. S. EPA and PSD Training agencies. Consider too that if you are successful, there will be training requirements that will accompany the PPE. And if you are able to purchase new PPE and are using it for protections from chemical and biological exposure, then the rest of your equipment needs to be integrated. To be effective, dry suits must have an integrated dry hood and dry gloves and be decontamination compatible (e.g. not made of neoprene which will absorb everything it contacts). At a minimum, a full face mask must be worn. 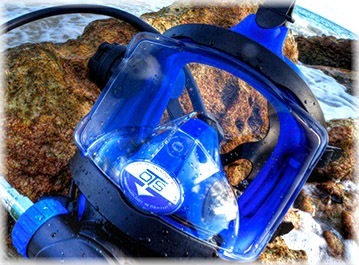 Air supplies must be integrated into the air delivery system so that the diver never needs to remove the full face mask. This is usually accomplished using a gas switch block. Consider the dive from beginning to end. If you are preventing your divers from being exposed to potentially harmful contact with contaminated water or sediment, then they will need to be decontaminated at the surface before removing their equipment. Your equipment inventory may not have the necessary supplies and equipment. But if you have a local haz-mat team – they do. Unless or until your team is able to be completely self-sufficient, use the available resources you have. Sometimes improvisation is required but decon in one form or another is always necessary! We use the term Risk/Benefit in our decision process when assessing any dive scene. Use it now to determine if your team is able to justify diving in the sediment layers your waterways. If you are really honest about it you will find that there is always room for improvement. If you make excuses to justify the risk, you are not helping. One realistic outcome of the assessment is that you will consider it and get fired up a bit about improving your own exposure protection. Realistically we have to accept that nothing is going to happen overnight. Becoming aware of the hazards and working to be proactive in improving your team safety is a start. These ideas of PPE for the dive team may be new but will be in language that is understandable and inarguable to those who manage your budgets. But it is going to take time and persistence before you may see steps forward. The ability to purchase or replace your dry suits will likely get shot down because of budgetary issues. But what is going to happen when you change the terminology and request PPE for the dive team? If you give up the fight and lose sight of the goal, you will never be able to make the step. If you continue to accept excuses while your team continues to dive in sludge, you are losing the fight. Your team will never get the recognition it deserves or the respect it has earned. You will always be the dive team who goes to the swimming pool or lake and calls it training. And one day in the distant future, one of your divers may be diagnosed with cancer that can be traced back to a dive event exposure. They will die a hero and your team mates will get tested and may find some similar issues. Then your team may get some extra funding. We call that reactive and inexcusable. The realistic outcome we would rather see is that you get fired up about PPE and fight until you get it. It may take a few years but the fight is worth it. As our society continues to grow and pollute, as new chemicals are created and new hazards develop, the physical health of your team may be in the balance. There is NO valid argument against providing adequate or necessary PPE. Divers can and have been debilitated by contaminated waters and sediments. There is no reasonable excuse for anyone to be injured or killed because of an accidental exposure. Waiting until it happens and dealing with the issue as a reactive solution means we hurt or killed someone. That is simply not acceptable. Present the problems with solutions and options. Be proactive and build a better, safer team. PPE is not an option. PPE is a necessity. Mark Phillips is a retired 33 year career firefighter and Public Safety Diver; A Master Scuba Instructor and PSD trainer. 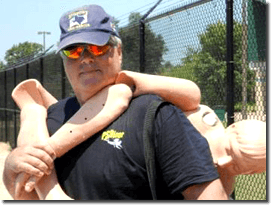 He is the Editor& Publisher of PSDiver Monthly, an Internet magazine dedicated to advancing the safety and knowledge of the Underwater Investigator. Subscribe for free at http://www.PSDiver.com.